Perhaps the most popular and well-known form of social dance, salsa originated in the Caribbean. The movements have their origins in Cuban Son, cha-cha-cha, mambo and Puerto Rican bomba and plena and other dance forms. Due to its many influences, the name salsa (meaning ‘sauce’ or ‘mixture’) is quite appropriate. The dance itself is a very elegant one, in which moves are interwoven seamlessly and succeed each other in high tempo. The basic steps are easy to learn yet difficult to master, making this the perfect dance to start off with. Most of the salsa classes are given by the University Sports Centre. S.D.A. 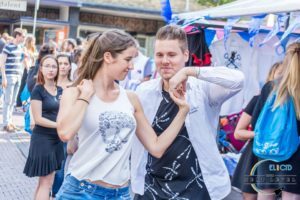 Leidance offers an extra class: Leidance Advanced Salsa Class. This is a superadvanced course for those who have finished the advanced course. Be aware that the level in this class is high! We hope to see you at the salsa classes!